EXCLUSIVE! A shirt for Dad, a snapsuit for Baby. They don't have to wear them at the same time, but life is much cuter when they do. 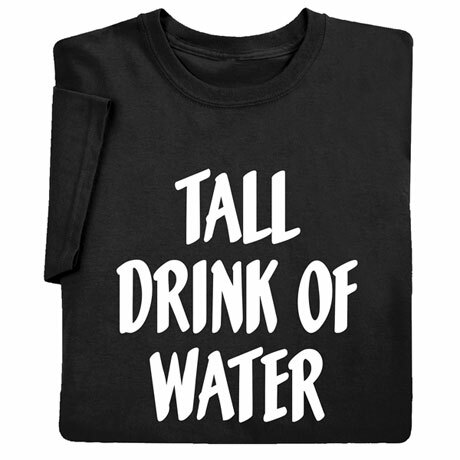 Black sweatshirt is 50/50 cotton blend, T-shirts are preshrunk 100% cotton. Both say Tall Drink of Water. Adult sizes S-3XL. Toddler tee sizes 2T, 3T, 4T, 5, 6. One piece snapsuit is 100% cotton, sizes 6,12,18 and 24 mos. Toddler and Infant garments say Short Sippy Cup of Juice. Imported.